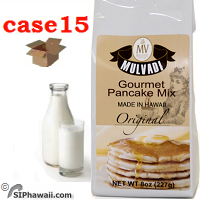 BY the CASE HAWAIIAN Food products and brands in caselots directly to HOUSEHOLDS - NO club membership NO registration required! 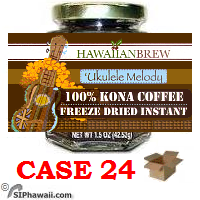 Buy the CASE LOT Bulk Sales fresh from Hawaii - it's Best if it is Fresh from Hawaii by the case lots and in multi packs. 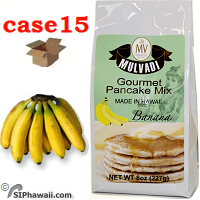 At SIPhawaii you can purchase top brand Hawaiian products in case lot quantities at great discount. Directly to Households, Organizations and Business welcome. 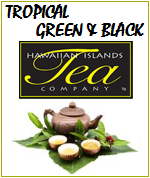 Ideal for giftbaskets, wedding gifts and company Christmas gift hampers or to compose your own Hawaiian themed gift baskets. LIMIT 1 case lot per order - Do Not Up Quantities - No Exceptions. Unfortunate our shopping cart is unable to work out shipping charges for multiple cases. If you require multiple cases please place multiple orders by going through the checkout again. 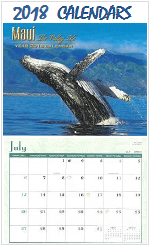 ~ Estimated delivery by USPS Priority Mail 2 - 5 Business Days after acceptance by USPS. No other carriers. No overnight, express shipping or rush orders - no exceptions. 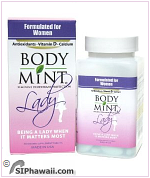 ~ Shipping $14.45 per case, to USA 50 States and YES WE DO ship to PO BOX, APO / FPO and Alaska. To prevent typing your address details for every order create an account first. Or you can create an account first, email us your order and then call with your credit card details. If you require insurance create an account first then email your order and call with your credit card details. ~ Our General Terms and Conditions also apply. conditions to and stored on the mainland first. 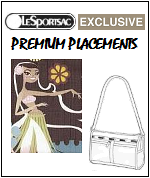 Email for other Hawaiian brands - products - More bulk offers coming soon. 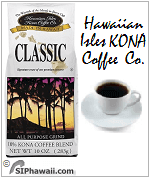 100% KONA Coffee range - Whole Bean and All Purpose Grind - APG - Instant coffee - 100% Hawaiian grown & roasted. From the Volcanic slopes of Big Island of Hawaii. By the Case conditions apply: LIMIT 1 CASE PER ORDER AND DO NOT ORDER ANYTHING ELSE WITH THIS ORDER. 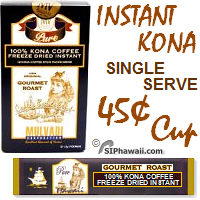 Mulvadi Coffee Single Serve Coffee sticks packed in boxes of 12 rip sticks or in Re-sealable Bulk Bags. 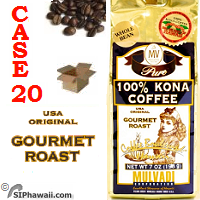 100% Kona Coffee from Hawaii - USA Original - Gourmet Roast. 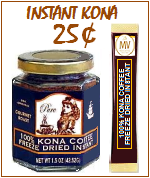 Granulated freeze dried instant. Each single serve packet contains 1.7 gram. 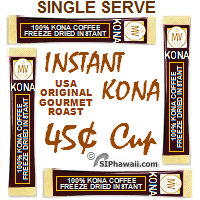 1 Pour contents in cup - 2 Add hot water - 3 Enjoy pure Kona Coffee. $199.00 / 40 cents stick. 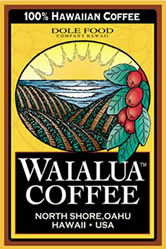 100% Oahu Waialua Coffee - Whole Bean and Ground - APG - Grown on the Dole Plantation - Estate Roasted Hawaiian Coffee. 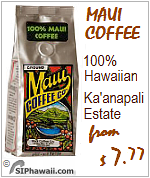 From the North Shore of Oahu overlooking the Surf - Packed in distinctive 7oz gold packs. 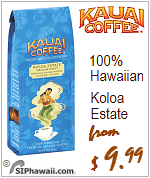 A smooth, mellow coffee characterized by a well-balanced cup with a hint of chocolate and pleasant lingering aftertaste. This Medium roast is for those who prefer a sweeter, milder tasting coffee with no bitter notes. 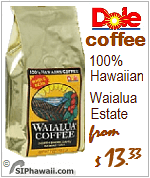 The coffee beans are medium light and toasty brown in color. Available in Ground or Whole Bean. 7 oz - 198g. 7 oz - 198g. 7 oz - 198g. OR IN 3, 6 OR 9 PACKS. 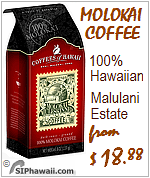 AS OF JUNE 1ST 2015 WE WILL START TRANSFERING THE 10% HULA GIRL COFFEE TO THE MULVADI LABEL. It's the same quality coffee but in a different gold colored pack. 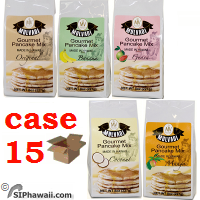 COCONUT SYRUP - Premium Quality - HAWAIIAN SUN Made in Hawaii since 1952 - The Original Hawaiian coconut syrup. 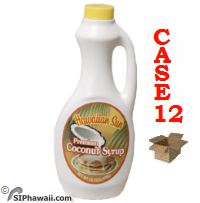 Hawaiian Sun Coconut Syrup by the case fresh from Hawaii - The Original PREMIUM syrup - Taste the difference! 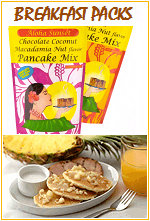 Perfect for Hotcakes, Pancake, Waffles, Desserts and Tropical Drinks at home or for serving in bars and restaurants. 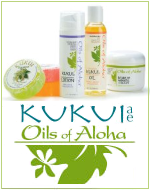 Hawaiian Sun strives to preserve the unique and delicious flavors of the Hawaiian Islands. 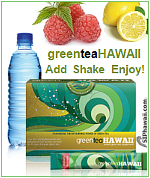 We hope you will try some of their products, and share them with your family and friends. The Apple Cinnamon flavor was discontinued by the manufacturer in June 2013. 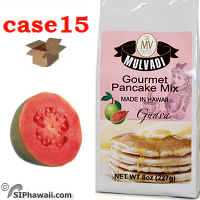 Gourmet PANCAKE MIX by Mulvadi - Kona Aina farms - Unflavored Original and Tropical fruity flavors. delightfully light and airy, but hearty and delicious breakfast. 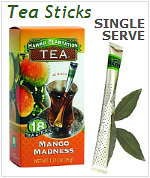 Available in 5 delicious flavors: Regular - Original Unflavored , Banana, Guava, Mango and Coconut. 8 oz packs. Total 7 1/2 Lb. 8 oz packs. Total 7 1/2 Lb. 8 oz packs. Total 7 1/2 Lb. 8 oz packs. Total 7 1/2 Lb. 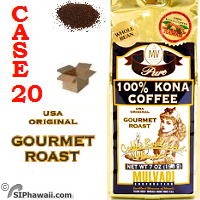 100% KAUAI Coffee All purpose grind - APG. 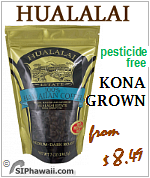 Regular and Tropical Flavored - Single Estate grown and roasted Hawaiian coffee. 7 oz - 198g. 7 oz - 198g. 7 oz - 198g. 7 oz - 198g.